Filice, Michelle. "Dene Games". The Canadian Encyclopedia, 27 September 2017, Historica Canada. https://www.thecanadianencyclopedia.ca/en/article/dene-games. Accessed 18 April 2019. Youth in Déline, NWT, playing Dene games (2011). Prior to colonization, the ​Dene​ economy centered primarily on hunting, fishing and food gathering. The Dene travelled over their vast traditional territory — from Hudson’s Bay to the Northwest Territories, across the Yukon and into the Alaskan interior — during the spring and summer months to collect food and materials to make clothing, shelter and tools. Some Dene groups also hunted game during the winter months, travelling great distances in snowshoes and toboggans. Dene games prepared the people for travel and for hunting, fishing and food collecting. They tested peoples’ endurance, speed, physical strength, resistance to pain and mental agility. For example, men prepared their fingers for carrying home heavy fish by playing Finger Pull — a game where players locked their middle fingers together and pulled as hard as they could until one person gave up. Since many of these games were created for, and played by, hunters and fishers, all of whom were male, they were traditionally male-only sports. When they were not testing men’s fitness and skill, Dene games were also played for fun; some games entertained people of all ages, male and female. Dene Swing, for instance, is a game where players attempted to push their opponent off a swing in a friendly competition. Although Dene games differed slightly across communities, they had striking similarities because the purposes of the games were the same. Dene games are still played today, although they are now performed for entertainment, to demonstrate athletic skill and ability, and for educational purposes. Many schools in the North teach Dene games as part of their curriculum as a means of transmitting Dene culture and history, and promoting healthy and active living. Females now compete in many of the games that were traditionally male-only. In many schools and community centres, Dene games are open to female and male participants alike. In 2004, the Arctic Winter Games (AWG) allowed young females to compete in certain Dene games for the first time, including Pole Push, Finger Pull and Hand Games. 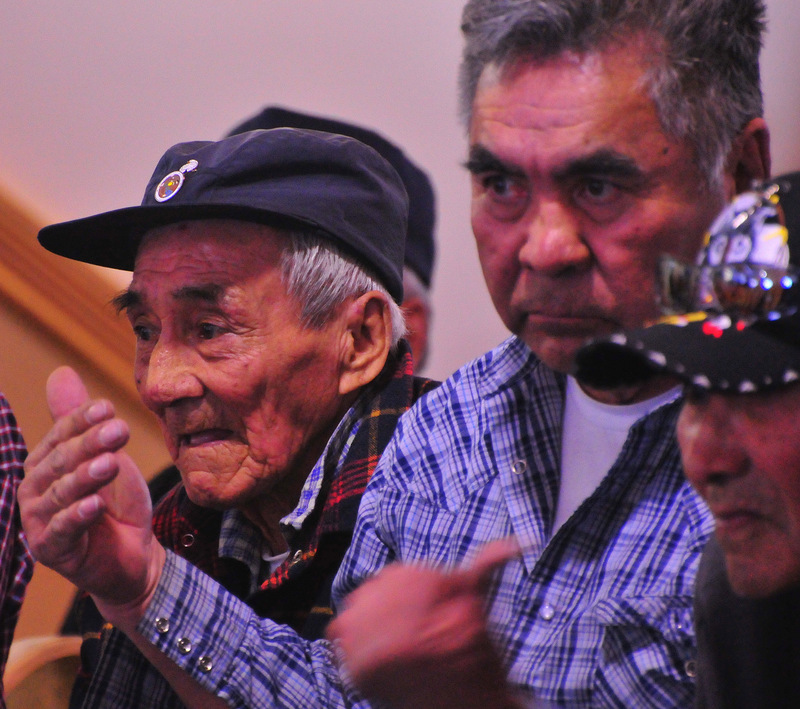 While this provided new opportunities for women, some argued that this did not create gender equality: as of 2016, women born before 1996 are still prohibited from competing in Dene games at the AWG, but men of any age can compete. Some Dene communities have expressed concern about including female competitors in certain games, citing cultural reasons why they should not; however, women are making slow and steady progress towards full inclusion. In May 2016, for example, the Yukon Hand Games Society held its first ever all-women Hand Games tournament. Although there are a variety of Dene games, five are widely played: Finger Pull, Snow Snake, Stick Pull, Hand Games and Pole Push. Various regional sports competitions feature these games, most notably, the Arctic Winter Games (AWG). The Dene games competition in the AWG has four age and gender classes: Open Male (no age restriction); Junior Male (born in or after 1996); Junior Female (born in or after 1996); and Juvenile Female (born in or after 2000). Each age group and gender category has four athletes from every competing territory that participate in these five events. The AWG generally sets the standard rules of play for these Dene games, although other sports competitions may have slightly different rules and regulations. This is an individual event, traditionally used to strengthen the fingers of fishers, who carried heavy fish from the shore to the camp using their fingers as hooks. The game involved two individuals in a test of endurance. The players locked their middle fingers together and pulled hard towards themselves until one player gave up. Today, the game is played with two players sitting, facing one another. There is a defensive and an offensive player. The goal of the defensive player is to prevent the offensive player from releasing the finger lock and/or straightening the defensive player’s arm. Each player must maintain specific positions during the game. The defensive player must extend their left leg straight out, bend their right leg and place their right foot on the inside part of their left thigh. They then place their right arm on their bent leg, turn their right hand palm-side up and place their left hand on their opponent’s left knee. The offensive player places their two feet against the opponent’s bent leg. They then place their left hand against the opponent’s left shoulder. The players now lock the middle fingers of their right hands. The offensive player begins by slowly and evenly pulling, trying to make their opponent lose grip or position. If this happens, the offensive player wins. If the defensive player prevents this, they win. The game generally lasts eight seconds for young players and 10 seconds for older, male players. The competition consists of a best of three pulls. This javelin-style individual event (see Track and Field) was once used to teach men how to hunt game. Caribou was especially significant to the Dene traditional economy and way of life; therefore, it was important for men to master hunting skills. In the early mornings, Dene hunters would sneak out onto the snow-covered lakes, where the caribou rested, and throw their spear along the snow, piercing and killing the animal. This required great accuracy and skill. Hunters therefore practiced this technique, which came to be known over time as the Snow Snake game. Today, Snow Snake is a distance game. Players must throw their 1.4 m spear as far as they can, underhand (the movement begins below the hip) and over a flat snow surface, contained on a track in a trough; the person who throws it the farthest wins. Players are allowed a run up of 7.62 m prior to each throw. They also have three attempts each. Although Snow Snake is considered a Dene game, other Indigenous peoples also play this game (or versions of it), including the Ojibwa and Haudenosaunee. Since the original purpose of the game was to train hunters, it follows that various Indigenous nations — the early economies of which usually relied on the hunting of large game — would develop their own form of Snow Snake. The concept of this individual game was (and still is) to pull a greased stick from an opponent’s hand, simulating the catching of a fish by hand. In the past, hunters would play this game after the community gathered and feasted on the food that they had provided. 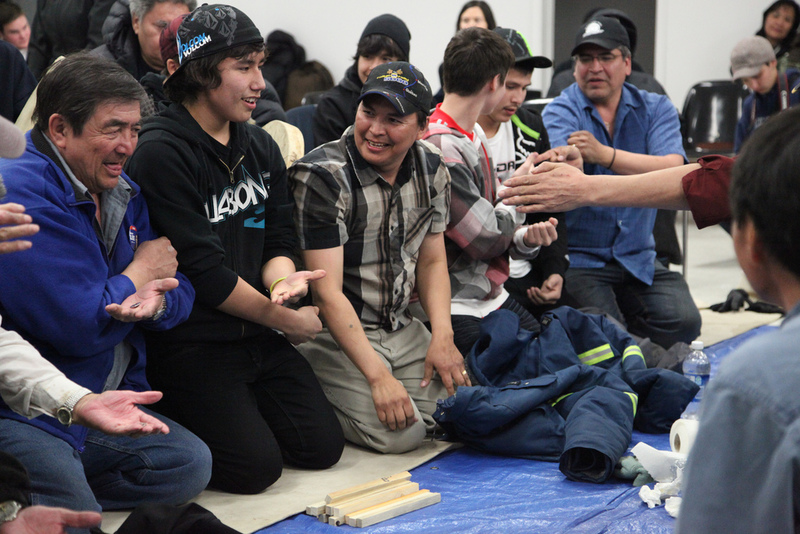 Sometimes, multiple Dene communities would come together to compete for the coveted stick. In modern competitions, two players stand facing one another, both grasping the stick with one hand. They then pull, hard and steady, with their hand braced against their hip, as they try to get the stick out of their opponent’s grip. Players cannot twist their arms or make body contact. They also cannot move their feet past a clearly marked position line on the floor. The stick must remain parallel to the ground at all times. The winner is the one who pulls the stick away from their opponent or who pulls the stick behind their hip, to the side of their body, for eight seconds, while their opponent still maintains a grip on the stick. The competition consists of a best of three pulls. Thisteam sport, also known as Stick Gambling, is one of the most widespread games played among Dene First Nations. Unlike many other Dene games that tested physical ability, hand games were guessing games played for fun or for trade purposes. Hunting parties bet weapons, tools and blankets on the outcome of the game. Two teams of about 20 men sat opposite each other, often separated by blankets spread on the ground. With singing and drum music playing in the background, one party hid small objects in one of their hands, while the other party tried to guess the location of the objects. In order to confuse the guessing party, players moved their hands and arms around their bodies or under the blankets. Guessers used hand signals to indicate where they believed the hidden objects were located. Sticks were awarded to correct guesses. The team with the most sticks won the game, and consequently, any goods or items that were bet on its outcome. The modern version of Dene Hand Games is very similar to the original version. Two teams of about four players and one captain sit facing one another, with blankets or jackets dividing the groups. One team hides objects in their hands and then moves their hands around rhythmically, to the sound of the drum music, placing their hands under their clothing or blankets. Often, players cross their arms over their chests, and use other body movements, facial gestures and sounds to try and outsmart the opposing captain, who must guess where the hidden objects are located. When the captain is ready to make a guess, he or she indicates so by whistling or making a loud sound. The captain uses a variety of hand signals in order to make a guess. Opposing players must show the captain their closed fists and then open the hand selected. If the captain’s guess is wrong (i.e., there was no object in the player’s hand), a stick is awarded to the opposing team. If the captain’s guess is correct, the opposing player is eliminated. The game goes on until the captain makes all the guesses possible or the opposing team wins all the sticks (often 12 in one game). Controversy has surrounded Hand Games in recent years, as women increasingly attempt to compete. Traditionalists argue that women were historically banned from Hand Games because of spiritual beliefs that menstruating women could distract male players with their “medicine power,” thereby jeopardizing the men’s ability to profit from this gambling game. While some Dene women and men still adhere to these beliefs, others have argued that women should be allowed to compete in Hand Games. Some contend that women were not necessarily banned from the game in the past, but rather, they never had the opportunity to play because this was a hunter’s game and women were not hunters. Today, women and girls are increasingly playing Dene Hand Games and are competing on behalf of their respective territories on national and international platforms. This is a tug-of-war-like team sport that tests players’ strength and endurance. Historically, players formed a circle around a fire and took turns trying to push each other out of the circle. 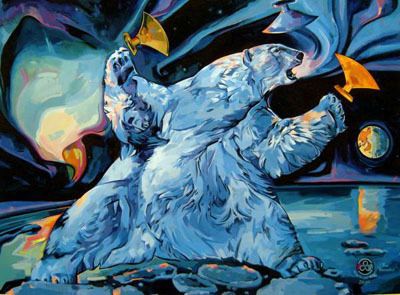 Although this was often played at community feasts and festivals, some Alaskan Gwich’in oral traditions state that the game was also played in honour of a deceased community leader. Today, Pole Push participants (usually four to a team) try to push the centre of a pole (roughly 6.10 m long) outside a clearly defined circle. Players dig their feet into the ground for grip and balance, and sometimes interlink arms, enabling them to push together. The pole cannot move above players’ shoulders or below their waists. Competitors are also not permitted to walk to the left or right if they are being pushed out of the circle. If players fall down or lose position during the competition, they are allowed to get up or regain position, as long as the centre of the pole is still within the circle. The best of three rounds determines the winning team. 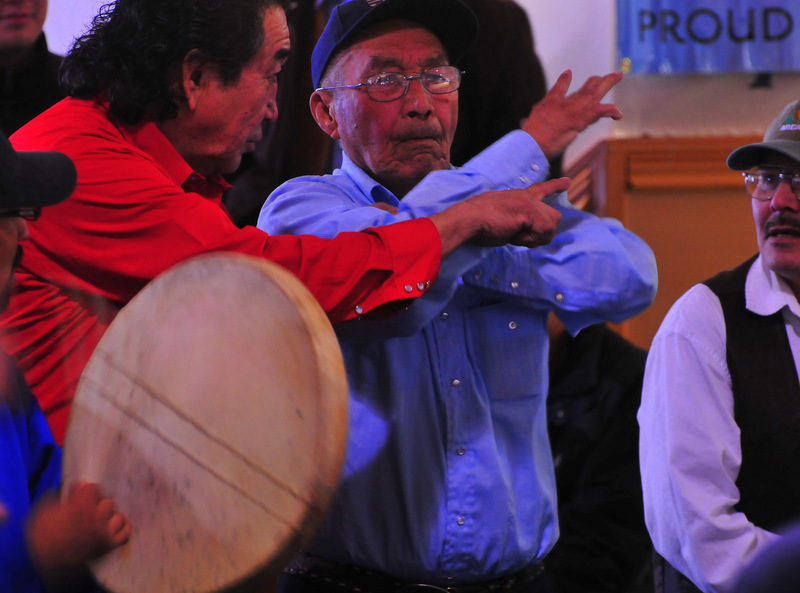 Some Dene games are less widespread and are specific to certain communities. For example, Hoop and Pole — a game where participants shoot arrows through a moving hoop — is most common among Dene-speaking peoples of the American southwest, while Hand Games were not traditionally well-known among all Gwich’in peoples. In other cases, popular games developed differently in various Dene communities over time, resulting in variations of game rules and objectives. For example, Moose Skin Ball (also known as Slavey Handball or Yukon Dodgeball) is a game where players try to get a ball into a basket or hole in the ground. Depending on the region, however, the game takes on elements of play akin to dodgeball, volleyball or rugby. In some versions of the game, the players who have been hit by the ball thrower are automatically out, whereas in other versions, players can be hit more than once before they are eliminated. In yet other versions, there are no winners or losers, and score is not kept. Despite these differences, games like Moose Skin Ball were often played by both men and women, and were therefore more inclusive than some other Dene games. Moose Skin Ball and its variations are still generally played in many Dene and Indigenous communities. Other games, however, have nearly disappeared, such as Dene Swing — a game Dene elders remember as fun and generally non-competitive (although sometimes gambling accompanied the game), open to people of all ages, and to both men and women. The object of the game was to try and push another competitor off a swing. Some Dene are trying to keep this game alive by playing it in their schools, communities and at international cultural demonstrations. Dene games are more than just athletic competitions or recreational sports; they have spiritual, cultural and historical significance for Dene peoples. They provide a link to the past, while also preserving culture and promoting healthy living. Although modern versions are somewhat different than the original Dene games, they still retain many of the same rules and traditions. C. Richard King, Native Americans in Sports (2015). Janice Forsyth and Audrey R. Giles, eds., Aboriginal Peoples and Sport in Canada: Historical Foundations and Contemporary Issues (2013). Chris Hallinan and Barry Judd, eds., Native Games: Indigenous Peoples and Sports in the Post-Colonial World (2013). Audrey Rhiannon Giles, Power, Policies and Politics: Women's Involvement in Dene Games in the Northwest Territories (2005).